OXFORD, Miss.—Dr. Katie Wilson, executive director for the National Food Service Management Institute at the University of Mississippi, has been officially appointed by President Barack Obama as the Deputy Under Secretary of Food, Nutrition, and Consumer Services with the USDA. The role includes a variety of responsibilities such as help with developing dietary guidelines and nutrition programs across the country. Dr. Katie Wilson, executive director of NFSMI since 2010, accepts new role as Deputy Under Secretary of Food, Nutrition, and Consumer Services with USDA. In January, Wilson received a phone call from the office of Kevin Concannon, Under Secretary for Food, Nutrition, and Consumer Services, about entertaining the idea of becoming Deputy Under Secretary. She officially accepted the job in March. 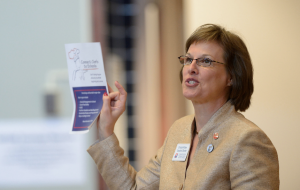 Since 2010, Dr. Wilson has served as the executive director of NFSMI on the UM campus. Established by Congress in 1989, the Institute is the only federally funded national center dedicated to education, training, and technical assistance for child nutrition programs. Wilson will resign from her position at NFSMI to fulfill her role with the USDA. Dr. Velmer Burton, Dean of the School of Applied Sciences, is very proud of Dr. Wilson’s appointment, noting that she did an exemplary job as the NFSMI director. Wilson will begin her new position with the USDA on May 1st where she expects to undergo discussion about national nutrition standards in schools.